There is always great excitement when I tell the girls that Oscar is coming in for a visit. Oscar is my miniature/small sized Labradoodle. 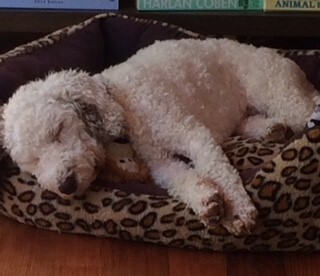 Labradoodles were bred to combine the best qualities of the Poodle and the Labrador to produce a dog that is suitable for people with allergies to dog fur, because they generally have a wool coat like Oscar’s and do not shed at all. Oscar is a gorgeous little fellow, gentle and loving and very intelligent. He knows lots of human words and at times he thinks he’s human. He is quite unique in that he has one brown ear and one white ear which always generates conversation when taking him to the dog park or for a walk! 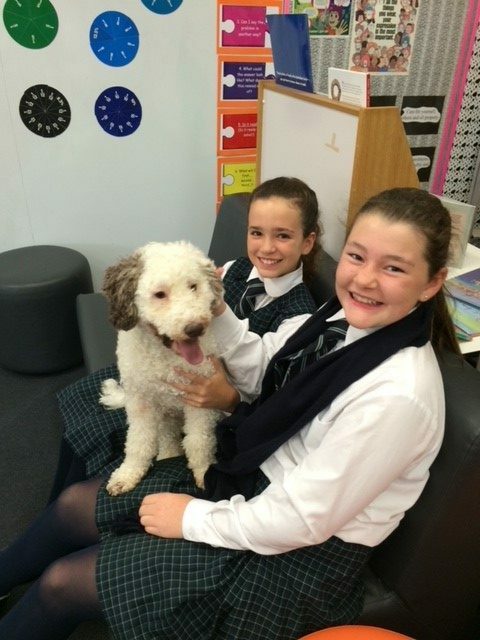 Oscar loves coming to school and has visited now and then since he was just a few weeks old. He laps up all the cuddles and attention the girls lavish on him. He usually starts his visit by doing a few excited, mad laps of the classroom, zooming around and jumping on the sofas before settling down. He loves to sit on the sofa with the girls, leaning into them for a cuddle or wandering the room and being patted as he passes by. After a while he settles to sleep in his bed or under my desk whilst the girls do their work. Having a pet or other animal in the classroom is always beneficial in bringing the class together, teaching how to be a responsible pet owner, creating a bond with the natural world and generally generating a calm, relaxed and harmonious atmosphere. 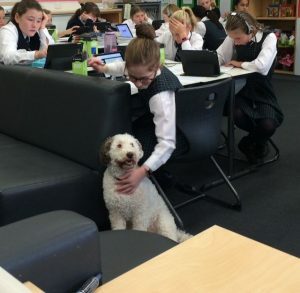 There have been many research articles published on the internet which detail the benefits of having animals in the classroom. I hope you enjoy these photos of Oscar at school. We gave him an A+.